Summary: "The war tried to kill us in the spring," begins this breathtaking account of friendship and loss. In Al Tafar, Iraq, twenty-one-year old Private Bartle and eighteen-year-old Private Murphy cling to life as their platoon launches a bloody battle for the city. In the endless days that follow, the two young soldiers do everything to protect each other from the forces that press in on every side: the insurgents, physical fatigue, and the mental stress that comes from constant danger. Bound together since basic training when their tough-as-nails Sergeant ordered Bartle to watch over Murphy, the two have been dropped into a war neither is prepared for. As reality begins to blur into a hazy nightmare, Murphy becomes increasingly unmoored from the world around him and Bartle takes impossible actions. It seems like I'm finally getting to a lot of the books that I received at this year's BEA. 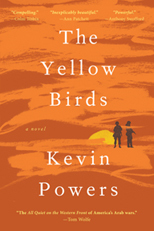 One book that has been so recent buzz is THE YELLOW BIRDS by Kevin Powers. While I knew this novel about one man's experiences during the war in Iraq was supposed to be very good (Entertainment Weekly gave it a B+), I was actually torn about reading it. I figured that, because of the subject matter, it probably wouldn't be an easy read. And did I really want to read a book that sounded so incredibly sad? However, I decided that I needed to read THE YELLOW BIRDS. Since the author is an ex-machine gunner in Iraq, I knew he would offer an inside look into life as a soldier; and it definitely wouldn't hurt me to learn about the sacrifices they make for the rest of us. Plus, I heard that his prose was stellar. The more I thought about it, the more I was excited to read this novel. There is no doubt about it -- THE YELLOW BIRDS is a gut-wrenching story about war, friendship, loss, and loyalty. It tells the story of Private Bartle, a 21 year old who was sent to Al Tafar, Iraq to fight for control of the city. He meets up with the very young (18 years old) Private Murphy at basic training and the two develop a unique friendship, with Bartle agreeing to watch out for Murphy. Bartle has absolutely no idea what this promise will eventually mean for him. As the war intensifies, both "men" know that they could die at any time, and they each deal with this reality in different ways. Murphy becomes more and more unstable, and his actions forces Bartle to take very extreme measures which end up having devastating effects. I can't possibly begin to express how powerful THE YELLOW BIRDS was. I actually broke down and cried a few times. This book was not an easy read for me, nor should it have been; however, I am very glad that I read it. I can't say that I actually enjoyed it because it was heartbreaking, but what I can say is that I appreciated it for a number of reasons. First of all, I think Mr. Powers is a gifted writer. I was extremely impressed with the beauty and elegance Mr. Powers' prose. Part of this book read like poetry, especially his descriptions of the war zone; and there is no doubt in my mind that we will be seeing more of this talented author. Another great thing about this book was story itself. I loved how the author presented it, alternating back and forth between Iraq, basic training, and the States. The book did jump around and the transitions weren't subtle, but I thought this showcased Bartle's disjointed state-of-mind -- and it definitely added to my sense of unease. In addition, I appreciated how the entire story gradually unfolded. While I knew pretty early on that a tragedy occurred and that Bartle was having a difficult time dealing with his guilt and grief, the details behind this tragedy were slowly revealed to the reader. I don't know if I would use the term suspenseful for this story, but the secrecy behind the unfortunate event definitely piqued my interest and kept me turning the pages. And finally, I appreciated that THE YELLOW BIRDS gave me an inside look into the horrors of war. As much as I can say the term, "War is hell," in all honesty, I have absolutely no idea what that really means. Discovering just a small portion of some of the atrocities that take place in the name of war was enlightening to me. I was both heartbroken and disgusted, and this novel further supported my thoughts that war should only be entered as a last resort.. if at all. In addition, I liked that this book showed not only the effects of war on the soldiers who serve, but also on the families who are left behind. THE YELLOW BIRDS was an extremely well written novel that I'm glad to say I've read. Definitely recommended! I received a copy of this novel at the 2012 BEA. I didn't pick up a copy of this because I generally stay away from war stories. Your enthusiasm about his writing has me reconsidering. I also avoided this book because I knew it would be heartbreaking! I had not heard about this book, but I think you've convinced me that I need to read it...off to the wish list it goes. Excellent review. I wasn't sure until I read your review, but now I want to read it. I'm reading this right now and it is blowing me away. It is extremely intense, though. I have to take breaks from it every once in a while.